El Trapio Restaurant. 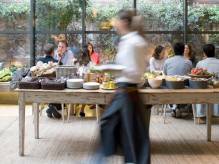 Good quality restaurant in beautiful house in zona alta - upper part of Barcelona. Outdoor terrace in the summer. No metro stations close by. Fernandez Restaurant offers an outstanding collection of Spanish specialities with an international flavour. Modern eclectic design.